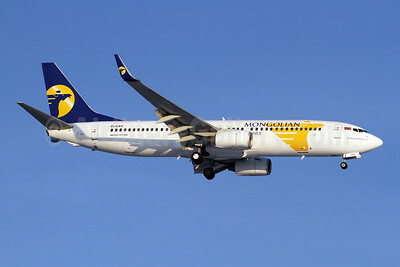 Mongolian Airlines (MIAT) (Ulaanbator) started twice-weekly summer seasonal service to Frankfurt on June 19 with its Boeing 767-300s. The flag carrier also serves Moscow and Berlin in Europe. Copyright Photo: Tony Storck/AirlinersGallery.com. Boeing 767-3W0 ER JU-1011 (msn 28149) taxies at Berlin (Tegel). 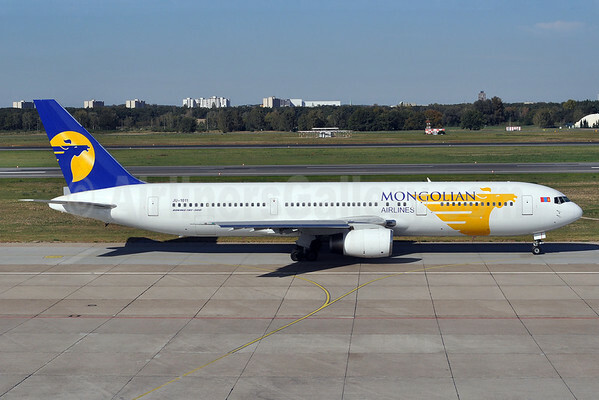 This entry was posted in MIAT Mongolian Airlines and tagged 28149, 767, 767-300, 767-3W0, Berlin, Boeing, Boeing 767, Boeing 767-300, Frankfurt, JU-1011, MIAT, MIAT Mongolian Airlines, Mongolian Airlines, seasonal service, Tegel, TGL on June 26, 2014 by Bruce Drum. 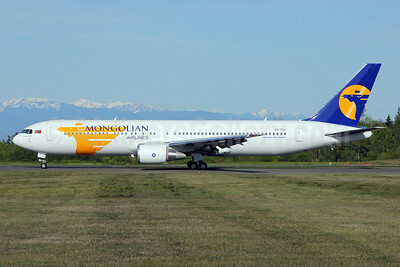 Mongolian Airlines Group (Ulaanbatar) on April 18, 2013 changed its name to the pictured Hunnu Air – Wings of Mongolia to avoid any confusion with MIAT Mongolian Airlines. Besides operating Fokker 50 aircraft on domestic routes in Mongolia, the carrier operates two Airbus A319s on scheduled routes from Ulaanbaatar to Bankgok, Hong Kong and Shanghai (SHA). The pictured Airbus A319-112 JU-8888 (msn 1750), named the “Great Mongol”, conducted a charter flight to Shizuoka/Mount Fuji, Japan on August 17, 2013. Copyright Photo: Akira Uekawa/AirlinersGallery.com. YU-8888 taxies to runway 12 at FSZ as flight MR 8136 bound for the Ulaanbaatar base. 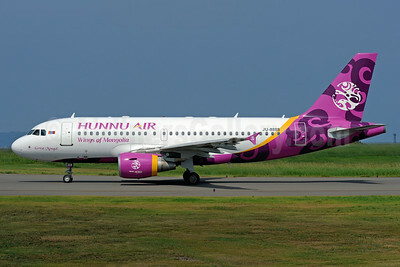 This entry was posted in Hunnu Air and tagged 1750, A319, A319100, A319112, Airbus, Airbus A319, Airbus A319100, aviation, FSZ, Hunnu Air, JU8888, MIAT Mongolian Airlines, mount fuji japan, Shizuoka/Mount Fuji, transportation, Wings of Mongolia on August 24, 2013 by Bruce Drum. 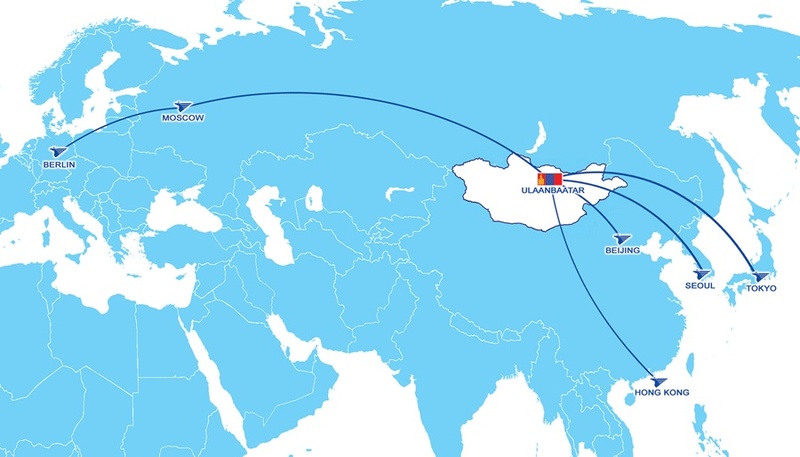 Boeing (Chicago) has delivered a 767-300 ER (extended range) to MIAT Mongolian Airlines (Ulaanbaatar), the first-ever direct purchase delivery to the airline. Mongolia’s flag carrier completed a historic order in 2011 at the U.S. State Department in Washington, D.C., marking the first time in more than two decades that the airline extended its route network by purchasing Boeing airplanes instead of leasing them. Copyright Photo: Nick Dean. Boeing 767-34G ER JA-1021 (msn 41519) was handed over to the carrier on May 13. This entry was posted in MIAT Mongolian Airlines, Mongolian Airlines and tagged 41519, 767, 767300, 76734G, aviation, Boeing, Boeing 767, Boeing 767300, boeing airplanes, boeing commercial airplanes, Everett, JU1021, MIAT, MIAT Mongolian Airlines, Mongolian, Mongolian Airlines, PAE, Paine Field, transportation on May 14, 2013 by Bruce Drum. 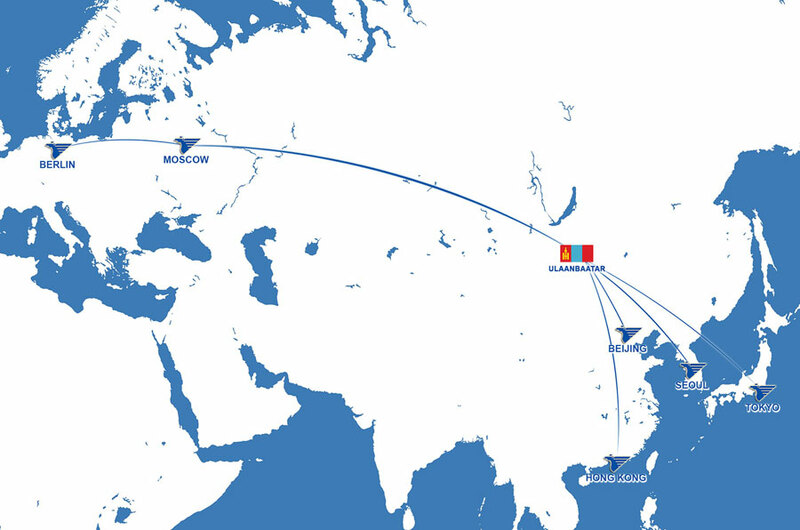 MIAT Mongolian Airlines (Ulaan Baatar) is expanding its route map (see below) with a new twice-weekly route radiating from Ulaan Baatar to Shanghai (Pudong) starting on January 17 according to Airline Route. This airline should not be confused with the newer Mongolian Airlines operating Airbus A319s on international routes. Copyright Photo: OSDU. Boeing 737-8CX EI-CXV (msn 32364) arrives in Moscow (Sheremetyevo) painted in the striking 2011 livery. EI-CXV is named for Khubelai Khaan or Kublai Khan, the fifth Great Khan of the Mongol Empire from 1260 to 1294 and the founder of the Yuan Dynasty in China. This entry was posted in MIAT Mongolian Airlines and tagged 32364, 737, 737800, 7378CX, aviation, Boeing, Boeing 737, Boeing 737800, EICXV, MIAT Mongolian Airlines, Mongolian Airlines, Moscow, moscow sheremetyevo, shanghai pudong, Sheremetyevo, SVO, transportation, yuan dynasty in china on December 31, 2012 by Bruce Drum. Mongolian Airlines Boeing 737-8AS WL EI-CSG (msn 29922) PEK (Michael B. Ing), originally uploaded by Airliners Gallery. Mongolian Airlines (MIAT Mongolian Airlines) (Ulaanbataar) has announced an order for two Boeing 737-800s and one 767-300 ER. The 767 will be assigned to the Moscow and Berlin route. The company acquired its first Boeing 767-300 in May 2011. Copyright Photo: Michael B. Ing. Please click on the photo for the full details. This entry was posted in MIAT Mongolian Airlines, Mongolian Airlines and tagged MIAT, MIAT Mongolian Airlines, Mongolian Airlines on June 21, 2011 by Bruce Drum.